An Action-Packed and Philosophical Sci-Fi Novel! On the other hand Devin's sister, Jane Colt, is miserable; her dreams to be a famous composer were crushed, and she forces herself to work a menial and tedious job within the family business. The only bright spot in her life is a young Via priest, Adam. Despite her assertions that the Absolute Being does not exist, Adam and Jane were able to cultivate a friendship that has the potential to develop into something more. Sarah DeHaven is an up and coming singer on the verge of fame. Acting on impulse, Devin asks Sarah to marry him. Sarah's reaction to the proposal scares him and makes him suspicious. He reaches out to his seedy connections to determine whether or not his suspicions about Sarah are correct, and finds himself in the middle of a conspiracy orchestrated by a mastermind known as "No Name" when he discovers Sarah's true nature. After a miserable day at work, Jane decides to drop by Adam's dorm at the seminary. She arrives just in time to see Adam being kidnapped by robots, and finds herself running for her life. After narrowly escaping her automated pursuers, she reports the kidnapping to the authorities; however, someone covered up the kidnapping and the authorities think that Jane is crazy. When Devin realizes that Sarah's true nature and Adam's disappearance might be connected, he decides to reveal his findings to his father. During the discussion in his father's office, the office's automated defense system is activated and Devin's father is shot. Realizing that he is being set up by whoever is behind Sara's true nature and Adam's disappearance, Devin decides to make a run for it on his own. Realizing that her brother plans to escape off-world to unravel No Name's plans, Jane insists upon being included because the conspiracy has affected her and the two of them embark on a journey that will ultimately reveal who No Name is; not realizing how far No Name's influence extends. 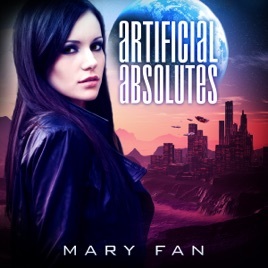 Artificial Absolutes by Mary Fan challenges readers to define sentience while entertaining them with appealing characters and action-packed twists. I felt that the characters were very developed, and I liked how Fan blended the characters' back stories into the story line to keep up the fast pace of the story rather than interrupting the story to flesh out the characters. I enjoyed how Fan asked philosophical questions in the book; she presented both sides of the argument effortlessly without forcing her opinion down readers' throats. If you like I, Robot by Isaac Asimov, try giving Artificial Absolutes by Mary Fan a shot; it is action-filled and asks similar philosophical questions. I know that I am delighted by the book, and plan on reading the next book in the Jane Colt series.